In what can best be described as a Rimmer moment, I decided that rather than paint Indian ships, I would keep up the planning and preparations for both fleets. ((In my defence, lately I have only had about one hour a night free for painting so that time is generally best spent in preparation tasks)) I started with the air support for the Chinese last night. Navwar makes some 1/3000th scale modern aircraft although these are on a base so not suitable for placing on flight decks. Some are quite small (the Ka25 Hormone for example) so I can understand the base. The aircraft prepared were some F-18s. ((I know, the Chinese don’t fly F-18s but at 1/3000th scale the look close enough to a J-15)) The Chinese carrier supposedly carries about 30 of these so I reckon 15 is near enough to represent in Shipwreck. 2:1 scale for these (some will be flying CAP after all). Also prepared were some Ka25 Hormones. These will be used to represent the Ka27 and Ka31 in use by the Chinese as at this scale, again, they look the same. 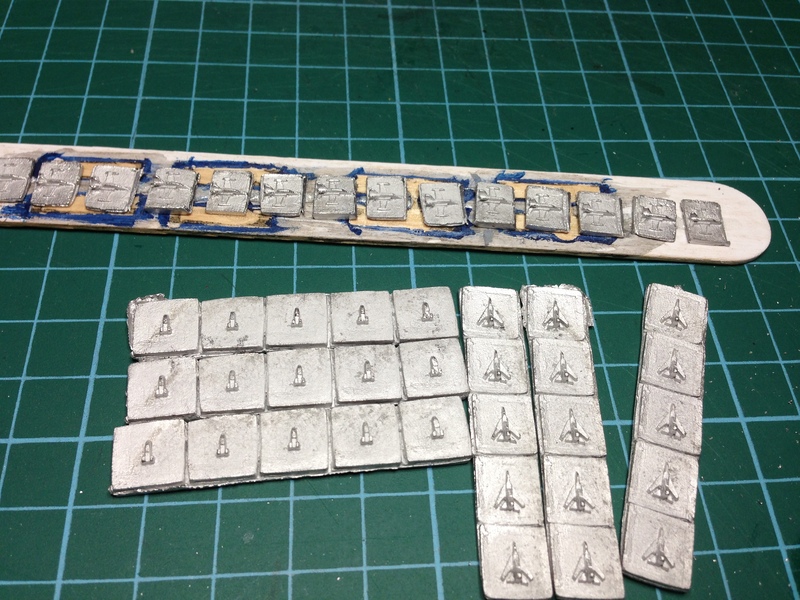 Tonight I will prepare the Indian aircraft – Harriers, Sea Kings, Ka-25s etc for their aircraft. Later I will replace the Navwar aircraft with Cap Aero 1/1200th scale aircraft. These look really nice flying across a fleet and the perspective of looking from above onto the aircraft with ships below looks about right. See some modern ships for Shipwrecked on the wonderful ofdiceandtinymen blog – another wargamer and painter I am in awe of the skill of – love his water bases, not to mention the ships. Thanks for the link Thomo 🙂 much apreshated, im glad you like the ships. I to am guilty of rimmer moments haven’t go to extreame organisation charts yet though….